The interior mall in the restored Arcade Building. This is the main entrance that will be used by Webster students. ST. LOUIS – It has been nearly three decades since the last time the Arcade Building was open for business. That will all change Jan. 4 when the building will come to life with Webster University graduate students starting classes in this new location. Undergraduate students will begin one week later on Jan. 11. The University is the anchor tenant in the Arcade Building, which Dominium Development finished renovating in early December. The University has been moving in furniture and installing electronics in its 54,000 square-feet of space since then. Webster University occupies the first and second floors of the building as well as the mezzanine level. Webster’s first-floor space includes offices for student services and administration, an art museum and 130+-seat auditorium for lectures and other live events. The Gorlok Grind, a book store/coffee shop open to the public is expected to open mid-January and is located on the first floor with an external entrance at the corner of Pine and 8th streets. The mezzanine area has more offices. The second floor has offices for faculty, meeting areas for students, and classrooms. The rest of the building has been developed into apartments and will be managed by Dominium. It is expected that some of the Arcade space will be made available to companies, organizations, and the general public to rent as event space. Webster University’s main campus in Webster Groves opened in 1915. In the St. Louis region, it also has locations in downtown St. Louis, in Westport, WingHaven and at Scott Air Force Base. 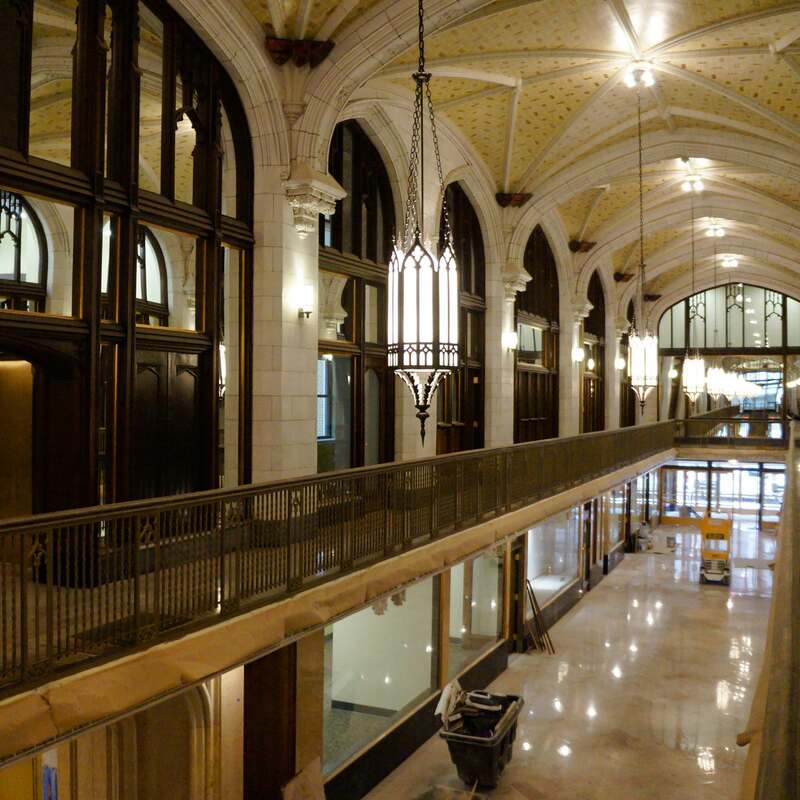 The combination of Webster’s spaces in the Old Post Office and the Arcade building make up the newly-named Webster University Gateway Campus. This month, Webster’s academic programs and services in the Old Post Office are relocating to the Arcade Building. Webster’s space in the Old Post Office hosts several University institutes and community partners, such as the Confucius Institute, the World Affairs Council and the Diversity Awareness Partnership. Some of those entities will remain in the Old Post Office while others will move to the Arcade Building. Any empty space in Webster’s area of the Old Post Office will be subleased to local businesses and organizations. Webster University opened its first downtown St. Louis location in 1975 at Broadway and Locust Street. In 2004, the University relocated the downtown location to become the anchor tenant for the renovated Old Post Office. Its building lease expires in 2019. The redevelopment of Old Post Office Square (bordered by Olive Street on the south, Locust Street on the north, Eighth Street on the east and Ninth Street on the west) has long been recognized as critical to the vibrancy of downtown St. Louis. When the project began in 1997 there were 70 empty buildings in downtown St. Louis. The Old Post Office was the first building revitalized in the 20-year project. With the completion of the Arcade building, there is only one empty building left in the area – the Chemical Building, located one block from the Arcade building. The Arcade building, completed in 1919, was joined with the Wright Building, originally built in 1906. It was one of the first indoor shopping malls in the United States and one of the tallest concrete structures in the world. The Arcade Building was designated a city landmark in 1980 and was listed on the National Register of Historic Places in 2003. For more information on the Gateway Campus, including the 22 graduate, undergraduate and certificate programs offered on site and a complete history of the building, visit http://www.webster.edu/gateway.